The first, and most important part of any party is the entry way. Grab your guest's attention at the front door with our decorations. Our door decorations range from metallic curtains to beaded curtains to door panels. We have door decorations for a wide variety of theme parties; one is bound to fit your needs! We have door decorations for Christmas, Halloween, Easter, and more! Decorate your doorway to greet your guests and help them get into the party mood. The entrance defines your party. Don't let your door go naked! Plain doors are boring and dull, so spice up your entry way with one of our many door covers. A decorated doorway improves the party atmosphere, taking your party to the next level. Make a fun and exciting entrance with this Disco Ball Beaded Curtain, perfect for a groovy 70's themed party. These colorful Gleam N' Metallic Curtains make a perfect entry for a fabulous Sweet Sixteen. Decorate for a 4th of July cookout with this Red, White, and Blue Gleam N' Curtain, perfect for a patriotic doorway. When the holidays roll around, hang this Welcome Velvet Lame Holiday Panel on your door, complete with hanging rods and string for simple set up. Most of our door decorations are made out of an all-weather material, so feel free to decorate all of your doors, both inside and out! No matter what kind of door decorations you're looking for we've got you covered right here at PartyCheap.com! Get the party started off on the right note by decorating the doorway! The first decorations they see will set the stage for a successful party. The doorway decorations will also ease any quests that are nervous about showing up in costume. We have so many different door covers, and door curtains you are sure to be able to find the perfect way to decorate your door without spending a lot of money. 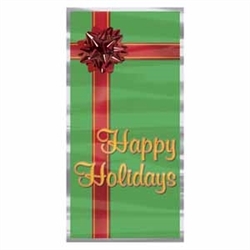 Whether you are decorating for a holiday party, baby shower, or a birthday we have all the door decorations you can imagine! Our door decorations are very easy to use too! All of our door covers are 30 inches wide and 5 feet long of plastic and easy to stick on your door. It sticks best with tape, pins, or party stick mounting tape. And of course we always love hearing from our very loyal customers! If you have any questions or ideas for new products feel free to give us a call or leave us a message! We’d be happy to hear from you! And who knows? You might just see your idea on our website in the near future! No matter what kind of door decorations and other party supplies you’re looking for we’ve got you covered! We’re PartyCheap.com and we know how to party!